Expanded perlite is most versatile and efficient mineral that has unique characteristics such as fireproof, insulation, sterile, and light weight. It naturally occurs in siliceous rock, and when exposed to heat to a certain temperature, perlite expands by 4 to 20 times. Expanded perlite is largely applied in construction activities for its light weight and insulation properties. Therefore it is used in concrete, to provide fire resistance, insulation and light weight concrete, ideal for building roof terraces and other applications such as filling void spaces. Expanded perlite properties provide solution to rising environmental concerns and do not have any negative impact on environment while mining of perlite. It can also blend with soil for filtration of storm water runoff and reduced rainwater surge. Increased demand for perlite-based products resulted in growth of processed crude perlite. In 2016, the U.S. encountered highest quantity of processed crude perlite since 2005, and highest domestic consumption of expanded perlite since 2011. Goldstein Research analyst forecast that the global expanded perlite market size is set to reach USD 1,670 million by 2025, growing at a CAGR of 4.73% over the forecast period. Supply of raw materials, innovation in expanded perlite processing and its applications and rising production of perlite are the major factors impacting the growth of global expanded perlite market. The report covers the present ground scenario and the future growth prospects of the expanded perlite market for 2017-2025 along with the global sales and global revenue of expanded perlite. We calculated the market size and revenue share on the basis of revenue generated from major players across the globe. We have forecast the market on the basis of perlite production, expanded perlite manufacturers, suppliers and distributors, raw material suppliers, revenue from industries using expanded perlite. Expanded perlite market report has been prepared based on an in-depth market analysis from industry experts. The report covers the competitive landscape and current position of major players in the expanded perlite market. The report also includes porter’s five force model, SWOT analysis, company profiling, business strategies of market players and their business models. Global expanded perlite market report also recognizes value chain analysis to understand the cost differentiation to provide competitive advantage to the existing and new entry players. On the basis of End-user, construction industry accounted for largest market share of 42.6% in 2017 of global expanded perlite market. Expanded perlite is considered to be green material in construction and has varied favorable properties in making cement, plasters, fire resistant beam and columns, roof and under-floor insulation. Application of expanded perlite in pharmaceutical industry is rapidly growing at a CAGR of 4.8%. Based on geography, Asia-Pacific region accounted for largest market share of 48.3% in 2017, owing to application of expanded perlite in construction projects that has major share in China (21%), India (7%), and Japan (6%). Over the forecast period APAC is expected to continue its large market share for the demand of expanded perlite across various industries in the developing countries and also China being the top producer of crude perlite. China is closely followed by Greece, Turkey, U.S.A. and Iran, contributing the major share in global production of crude perlite. With the advent of sustainability across various sectors, use of expanded perlite is trending in the market. Its application has gained wide attention from agriculture industry, for horticulture as a constituent of soil-less growing mixes where it stipulates aeration and optimum moisture retention for plant growth. Production of cucumber and tomato are some that gained benefit from application of expanded perlite. The growth in allied industries using expanded perlites such as food and beverage industries, cosmetic industry, and moreover in the environment cleaning, where it can absorb oil and pollution from environment, is thus driving the growth of global expanded perlite market. Advancement in technology and practices to efficiently manufacture and utilize expanded perlite is also stimulating the growth of the market. Exporting costs can be avoided when selling domestically, but most of these costs are linked with transportation and taxes while exporting perlite. In 2016, U.S.A. crude perlite production was 473,000 metric ton, and the prices increased by 1.6% since 2015. Thus, there is a threat of substitutes that can take over the market, such as diatomite, pumice, expanded clay and shale and slag. 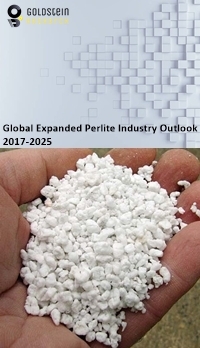 Global Expanded perlite market report comprises of the following companies as the key players in the expanded perlite market: Florapeat GMBH, Imerys SA, Supreme Perlite Company, Cornerstone Industrial Minerals Corporation, and Silbrico Corporation, Showa Chemical Industry Co., Perlite Canada, Inc., Cevahir Perlite. What is the revenue of expanded perlite market in 2016-17 and what would be the expected demand over the forecasted period?